The chuffin cat prides herself on her prolific hunting skills. There are times however, when I think that she’s more into socialising with the local rodent population than hunting them. I do wonder if one day I will come home earlier than expected, only to find her hobnobbing with an assortment of mice, shrews and voles at a cheese and breadcrumb party. Of course, if there’s any chance whatsoever of illiciting help to irritate or embarrass her human staff, she will grasp that wholeheartedly with both paws: a laugh at a human’s expense is always worth pursuing. I step outside and take a deep breath as the chuffin cat approaches me. 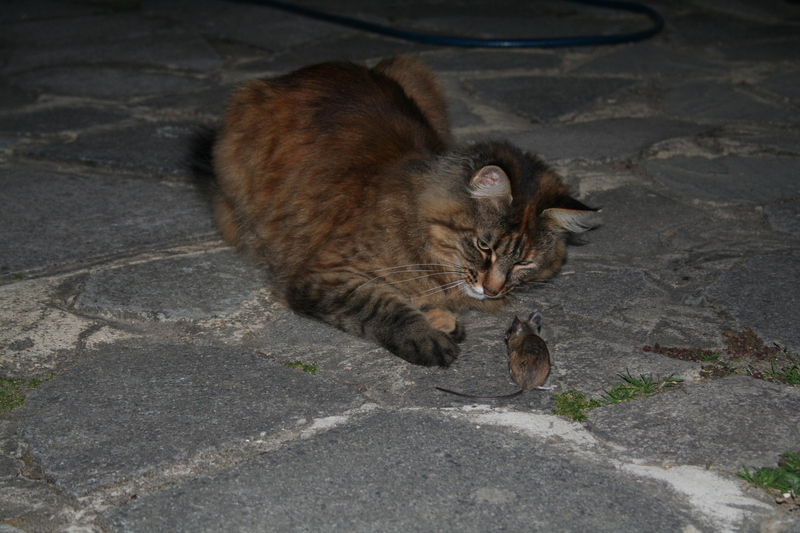 She carefully deposits the lifeless body of a small, brown mouse at my feet and steps backwards. Shaking my head sadly, I grab a tissue from my pocket and bend down to pick up the peace offering. The mouse gasps, springs to life and runs straight up my leg. Aaaaggghhhrrrrr.